In the era of cyber-physical systems, the area of control of complex systems has grown to be one of the hardest in terms of algorithmic design techniques and analytical tools. The 23 chapters, written by international specialists in the field, cover a variety of interests within the broader field of learning, adaptation, optimization and networked control. 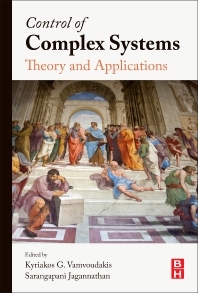 The editors have grouped these into the following 5 sections: “Introduction and Background on Control Theory”, “Adaptive Control and Neuroscience”, “Adaptive Learning Algorithms”, “Cyber-Physical Systems and Cooperative Control”, “Applications”. The diversity of the research presented gives the reader a unique opportunity to explore a comprehensive overview of a field of great interest to control and system theorists. This book is intended for researchers and control engineers in machine learning, adaptive control, optimization and automatic control systems, including Electrical Engineers, Computer Science Engineers, Mechanical Engineers, Aerospace/Automotive Engineers, and Industrial Engineers. It could be used as a text or reference for advanced courses in complex control systems. Kyriakos G. Vamvoudakis was born in Athens, Greece. He received the Diploma (a 5 year degree, equivalent to a Master of Science) in Electronic and Computer Engineering from Technical University of Crete, Greece in 2006 with highest honors. After moving to the United States of America, he studied at The University of Texas with Frank L. Lewis as his advisor and he received his M.S. and Ph.D. in Electrical Engineering in 2008 and 2011 respectively. From May 2011 to January 2012, he was working as an Adjunct Professor and Faculty Research Associate at the University of Texas at Arlington and at the Automation and Robotics Research Institute. During the period 2012-2016 he was a Project Research Scientist at the Center for Control, Dynamical systems and Computation (CCDC) at the University of California, Santa Barbara. He is now an assistant professor at the department of Aerospace and Ocean Engineering at Virginia Tech. His research interests include approximate dynamic programming, game theory, nonlinear control, and optimal control. Recently, his research has focused on network security, smart grid and multi-agent optimization. Dr. Vamvoudakis is the recipient of several international awards including the 2016 International Neural Network Society Young Investigator (INNS) Award, the Best Paper Award for Autonomous/Unmanned Vehicles at the 27th Army Science Conference in 2010, the Best Presentation Award at the World Congress of Computational Intelligence in 2010, and the Best Researcher Award from the Automation and Robotics Research Institute in 2011. He is a member of Tau Beta Pi, Eta Kappa Nu and Golden Key honor societies and is listed in Who’s Who in the World, Who’s Who in Science and Engineering, and Who’s Who in America. He has also served on various international program committees and has organized special sessions for several international conferences. He currently is a member of the Technical Committee on Intelligent Control of the IEEE Control Systems Society (TCIC), a member of the Technical Committee on Adaptive Dynamic Programming and Reinforcement Learning of the IEEE Computational Intelligence Society (ADPRLTC), an Associate Editor of the Journal of Optimization Theory and Applications, an Associate Editor on the IEEE Control Systems Society Conference Editorial Board, an Editor in Chief of the Communications in Control Science and Engineering, a registered Electrical/Computer engineer (PE) and a member of the Technical Chamber of Greece. He is a Senior Member of IEEE. Dr. Jagannathan Sarangapani (referred here as S. Jagannathan) is at the Missouri University of Science and Technology (former University of Missouri-Rolla) where he is a Rutledge-Emerson Endowed Chair Professor of Electrical and Computer Engineering and Site Director for the NSF Industry/University Cooperative Research Center on Intelligent Maintenance Systems. His research interests include neural network control, adaptive event-triggered control, secure networked control systems, prognostics, and autonomous systems/robotics.